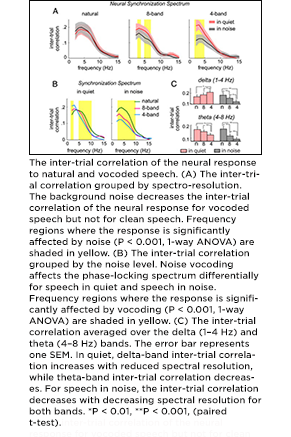 Simon, Ding and co-author Monita Chatterjee examined how brains extract and process speech when the speech is acoustically disrupted by noise, and even more interestingly, for the case as it would be heard by a cochlear implant user. They found that the brain can cleanly extract the speech even as heard through a cochlear implant, as long as there is no surrounding noise. But even moderate noise severely disrupts the brain’s ability to extract the speech under cochlear implant listening conditions. The article can be found online or in PDF format. Ding received his Ph.D. in electrical engineering at the University of Maryland in 2012. He is now a post-doctoral researcher at New York University. He works in David Poeppel's cognitive neuroscience research lab in the NYU Department of Psychology. His research interests include speech perception and neural computations in auditory cortex. Simon directs the Computational Sensorimotor Systems Lab at the University of Maryland. His primary research interests include: auditory neural computations and representations; magnetoencephalography and cortical physiology; signal processing in biological systems; and computational and theoretical neuroscience.